by Chris Woodford. Last updated: October 22, 2018. A box that makes pictures from a soup of hot gas? Whatever next? Cars that can fly? Men on Mars? It may sound like something straight out of Flash Gordon, but plasma television is far from science fiction. It's a brilliant example of how cutting-edge science can be applied to everyday problems to make our lives better and more fun. Let's take a closer look at how it works! 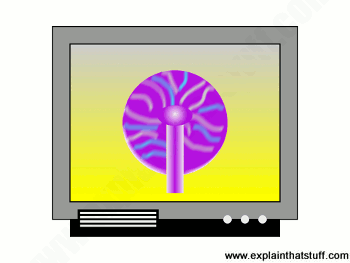 Artwork: A television powered by plasma. You often can't tell from a quick look whether a flatscreen TV is LCD, plasma, or even OLED. It used to be the case that if you wanted a very large TV, you'd have to buy a plasma screen, but LCD and OLED screens are now available in very large sizes too. Photo: Playing with plasma. Plasmas are made when some of the electrons in a gas break free, leaving behind a positively charged nucleus called an ion. The negatively charged electrons and positively charged ions make it possible for the gas to conduct electricity. This glass sphere contains plasma: a hot, ionized gas produced with an electric current. 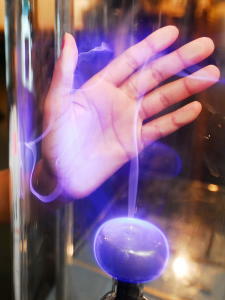 When you put your hands on the glass, they attract free electrons so the plasma seems to move toward you. Photo by John Suits courtesy of US Navy. In schools they teach us that all substances come in three basic flavors or states of matter: solid, liquid, and gas. But they're wrong! There's a fourth flavor called plasma (and a fifth one called a Bose-Einstein condensate too, that we won't get into here, but which earned three scientists the 2001 Nobel Prize in Physics). What exactly is a plasma and how does it relate to solids, liquids, and gases? Suppose you have a lump of freezing cold ice (a solid). Heat it up a bit and you'll get a liquid (water). Heat it up a bit more and, pretty soon, you'll have a gas (steam). The more heat you supply, the more energy you inject. The more energetically the molecules (or atoms) have, the further apart they can push and the more they move about. In a solid like water, the molecules are bound tightly together; in liquid water, the molecules are free to move past one another (that's why water can pour and flow); in steam (gaseous water), the molecules are completely free of one another and have so much energy that they spread out to fill all the space available. But what happens if you don't stop there? What if you keep on heating a gas? The molecules and atoms inside it break apart, releasing some of their electrons so they move freely in and around it. When atoms disintegrate like this, they form positively charged particles called ions. The mixture of positively charged ions and negatively charged electrons in a plasma turns it into a kind of hot soup that will conduct electricity very easily. That's what we mean by a plasma. It's a special type of gas in which some of the atoms have become ions (an ionized gas, in other words). If you've read our articles on energy-saving fluorescent lamps (also known as CFLs) and neon lamps (the lamps that make brightly colored displays in our streets), you'll know how they make light by buzzing electricity through a gas. Imagine if you built a TV screen out of millions of microscopically tiny CFLs or neon lamps, each of which could be switched on or off very quickly, as necessary, by an electronic circuit, to control all the separate pixels (lit-up, colored squares) on the screen. That's pretty much how a plasma TV works and it's very different to other kinds of television technology: in a conventional (cathode-ray) television, the picture is built up by scanning an electron beam back and forth over a screen treated with chemicals called phosphors; in an LCD TV (liquid-crystal display television), polarizing crystals make light rays bend to switch the pixels on and off. The pixel cells in a plasma TV have things in common with both neon lamps and CFLs. Like a neon lamp, each cell is filled with tiny amounts of neon or xenon gas. Like a CFL, each cell is coated inside with phosphor chemicals. In a CFL, the phosphor is the chalky white coating on the inside of the glass tube and it works like a filter. When electricity flows into the tube, gas atoms crash about inside it and generate invisible ultraviolet light. The white phosphor coating turns this invisible light into visible white light. In a plasma TV, the cells are a bit like tiny CFLs only coated with phosphors that are red, blue, or green. Their job is to take the invisible ultraviolet light produced by the neon or xenon gas in the cell and turn it into red, blue, or green light we can actually see. 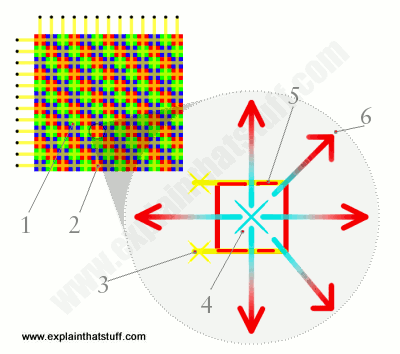 Much like the picture in an LCD screen, the picture made by a plasma TV is made from an array (grid) of red, green and blue pixels (microscopic dots or squares). Each pixel can be switched on or off individually by a grid of horizontally and vertically mounted electrodes (shown as yellow lines). Suppose we want to activate one of the red pixels (shown hugely magnified in the light gray pullout circle on the right). The two electrodes leading to the pixel cell put a high voltage across it, causing it to ionize and emit ultraviolet light (shown here as a turquoise cross, though it would be invisible in the TV itself). The ultraviolet light shines through the red phosphor coating on the inside of the pixel cell. The phosphor coating converts the invisible ultraviolet into visible red light, making the pixel light up as a single red square. Artwork: Bitzer's original plasma display. From US Patent 3,559,190: Gaseous display and memory apparatus by Donald Bitzer et al, University of Illinois, courtesy of US Patent and Trademark Office. The first practical plasma screen was developed in the 1960s by Donald Bitzer, Hiram Slottow, and Robert Willson of the University of Illinois, as part of an educational computer system called PLATO. This is one of Bitzer's own illustrations of his invention from his original patent, which was filed in 1966 and eventually granted in 1971. Like my illustration above, you can see that the screen consists of multiple, gas-filled display "minicells" (the orange blobs in the central blue section). In front and behind this are two sets of electrodes, one running horizontally and the other vertically. Each gas minicell ("blob") in the screen can be fired by energizing the appropriate pair of electrodes either side. Since each minicell can only be either on or off, this screen can display monochrome pictures but not color ones. What's the difference between plasma and LCD TV? Plasma and LCD TVs look very similar but, as we've just seen, work in totally different ways. Plasma TVs tend to cost an awful lot more, so why not just buy an LCD? The main difference is that the cells that make up the pixels in a plasma TV can switch on and off thousands of times faster than the pixels in an LCD screen, so you get clearer pictures with less blur, especially for moving images during action movies or sports games. (The latest LCD screens switch on and off more quickly than older ones, but it's generally true that plasma screens are faster.) Plasma TVs are also typically brighter and have higher contrast, which can be important if you watch a lot of TV in the daylight. You can view plasma screens from a wider angle without seeing distortion of colors (like you get on an LCD computer screen), so they're often better for larger audiences (projection TV is another option for showing pictures to a roomful of people). But there are drawbacks with plasma too. They're more power hungry than LCDs and the screens are heavier and more fragile, so you have to be very careful when you transport them. Plasma TVs also have problems with "burn in" (where images that are displayed for too long can permanently damage the screen) and they tend to "burn out" (stop working through too much use) more quickly than LCDs, though most people are likely to replace a TV for something newer before this happens. Generally speaking, plasma TVs are much cheaper than they used to be, while LCD TVs are much faster than they used to be, and the two technologies are now very broadly comparable for ordinary household viewing. Over the last few years, these two dependable technologies have been joined by OLED (organic LED) TVs, which are thinner, brighter, and give truer blacks than either plasma screens or LCDs. Many people are now switching to OLEDs because they give better, faster pictures than LCD screens without the bulk or the power consumption of plasmas. Television: Covers traditional cathode-ray TV. HDTV (High-definition television): More detailed flatscreen pictures. IPTV (Internet Protocol Television): How to watch live TV pictures online. LCD TV: The other main flatscreen technology. Projection TV: Projectors that throw TV pictures onto your wall. LEDs, organic (OLEDs) and LEPs (light-emitting polymers): Ultra-thin displays that could be the future of TV? Television Technology Demystified: A Non-technical Guide by Aleksandar Louis Todorovic. Focal Press, 2006. Covers the general principles of TV. Plasma Physics and Engineering by Alexander Fridman and Lawrence Kennedy. CRC Press, 2012. Plasma Chemistry by Alexander A. Fridman. Cambridge University Press, 2008. Plasma Science: Advancing Knowledge in the National Interest by Plasma Science Committee. National Academies Press, 2007. Kiss Your TV Goodbye by Paul O'Donovan. IEEE Spectrum, 25 Apr 2016. LCD, plasma... or none of the above? What does the future hold for TVs in the Internet age of super-thin OLED displays? LED LCD vs. OLED vs. plasma by Geoffrey Morrison. CNET, November 18, 2013. Which TV technology will suit you best? Choosing a big TV: Wired, 15 November 2011. Lists some of the things you need to consider when deciding between LCD, plasma, and other TV technologies. The Death of Plasma TV: You Read it Here First by Tekla Perry. IEEE Spectrum, 19 February 2009. How LCD, OLED, and other technologies have eaten away at plasma's market share. What's greener: an LCD or plasma TV? by Umbra Fisk, The Guardian, 26 February 2009. Which technology should eco-friendly TV lovers opt for? Do flat-screen TVs eat more energy? by Sean Coughlan, BBC News, 7 December 2006. Plasma TVs can use up to three times more energy than old-style cathode-ray TVs or larger LCD TVs. 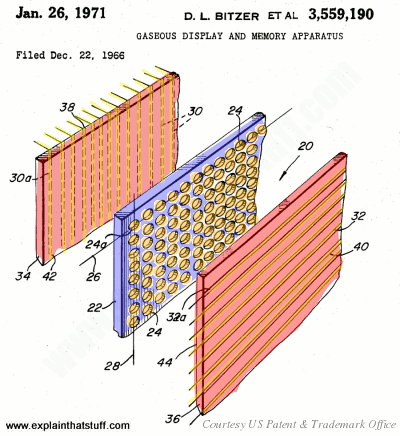 US Patent 3,559,190: Gaseous display and memory apparatus by Donald Bitzer et al, University of Illinois, 26 January 1971 (filed in December 1966). The original gas plasma display produced for the PLATO educational computer system. US Patent 5,525,862: Electro-optical device by Shigeki Miyazaki, Sony Corporation, 11 June 1996. US Patent 5,971,566: Plasma display device and its manufacturing method by Yutaka Tani et al, Matsushita Electric Industrial Co., Ltd., 26 October 1999. US Patent 7,477,328: Plasma television, display panel type television, and fabrication method for display panel type television by Naoto Maruta, Funai Electric Co., Ltd. 13 January 2009.